Donald Trump brought up his longtime nemesis Rosie O’Donnell at a presidential debate. Again. Why Did Trump Bring Up Rosie O’Donnell of All People in the Debate? Rosie O’Donnell, in a scene from a recurring nightmare of Donald Trump’s. In Monday night’s debate, Donald Trump ticked off some of the accomplishments that qualify him to lead our nation: He has had big-league success in the business world, he was against the Iraq war (ish), and he and he alone has protected our country from the longstanding threat that is Rosie O’Donnell. 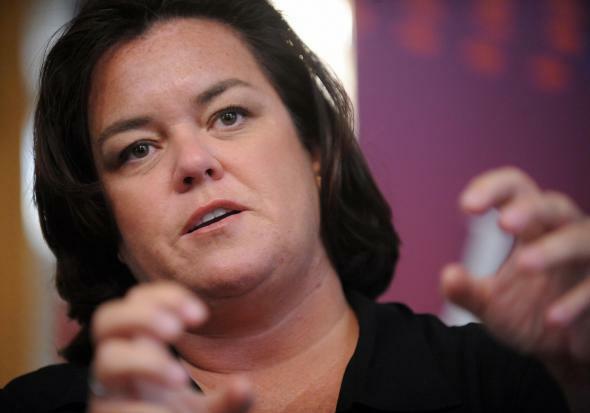 Yes, Rosie O’Donnell: actress, comedian, former talk show host, freeform poet, onetime bestie of Madonna, and, apparently, national menace worthy of mentioning in a presidential debate. Now, shouldn’t a presidential candidate have bigger concerns? Wouldn’t a worthy presidential nemesis be, I don’t know, the head of ISIS or North Korea, and not a woman who used to be best known for starring in A League of Their Own and shooting Koosh balls into her adoring audience? But as those who’ve been paying attention know, this isn’t even the first time O’Donnell’s name has come up in a debate! These two have history. How did O’Donnell get embroiled in this mess? That’s a long story, so settle in. The Trump-O’Donnell hostilities started in 2006, when O’Donnell had the gall to criticize Trump on the View, which she was then a co-host of. She pointed out that he had gone bankrupt and had an affair while married, making him perhaps a less-than-ideal moral arbiter for censuring a wayward Miss USA. Fair enough, you might say, but Trump got angry and called Rosie a “loser,” one of his favorite insults. Later that year, he called her a “fat pig” in an interview with Fox News, also throwing in that she was “a mental midget, a low-life.” “Degenerate” and “slob” were a few other choice descriptors. Over the years, Trump has continued to insult O’Donnell on Twitter from time to time, one of the various low-level feuds he periodically tends to like a plate spinner at the circus. When you look at the tweets altogether, what’s most striking might be how much he seems to care about ratings and who’s hosting the View at any given time. Maybe paying a little more attention to public policy instead of daytime TV wouldn’t be the worst thing, but who am I to say? His comments about Alicia Machado, the 1996 Miss Universe winner who he publicly shamed for gaining weight, have had a similar tenor. What?, he seems to ask of his critics, She really did gain too much weight! And Rosie O’Donnell really is a fat pig! These are the “tough” things he said to O’Donnell, the things he thinks she deserves and that in fact serve as proof that he doesn’t back down from his convictions. His obsession with looks and weight is not only offensive, which it very much is, but it’s also beside the point: What kind of leader gets distracted by such petty dramas? Yep, the “temperament” question: What if he has a disagreement with a head of state, calls that head of state a fat pig, and surprise! We all get nuked. With his dying breath, Trump would probably blame Rosie O’Donnell for starting it in the first place, the slob. Correction, Sept. 27, 2016: This post originally misspelled Megyn Kelly’s first name.